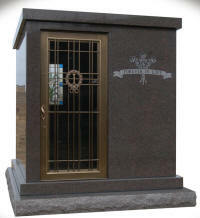 Private estate mausoleums provide above-ground entombment at an affordable price. Once regarded as only for the well-to-do, a private estate mausoleum is an affordable option for families today. If you combine the cost of grave space, grave opening, burial vault and memorial, our private estate mausoleums are a very competitive alternative to traditional burial.